You say to me... Your brain is broken. No- my brain is imperfectly perfect; an adult's brain in training. Mortal Fools theatre company presents Brainstorm; a fast paced, dynamic and physical performance theatre show coming to Sunderland, Gateshead and Barrow-in-Furness. For young people and their parents, the show explores how young people’s brains work and why they’re designed and have evolved to be imperfectly perfect. Mortal Fools have been working with a group of young people from their flapship youth theatre, Tyne Valley Youth Theatre, to create their production of 'Brainstorm'; a part-scripted play exploring teenage brain development and how this translates to real-life experience. Using a script developed by Ned Glasier, Emily Lim and Company Three in collaboration with neuroscientists; Mortal Fools Director Helen Ferguson and the ensemble cast delve into their personal experiences to explore their relationships with their parents and themselves, whilst making sense of the world around them. Inside every young person’s brain, 86 billion neurons connect, crash, collide and clash to cause daily chaotic and exhilarating changes; a hive of constant activity, growing, evolving, changing. 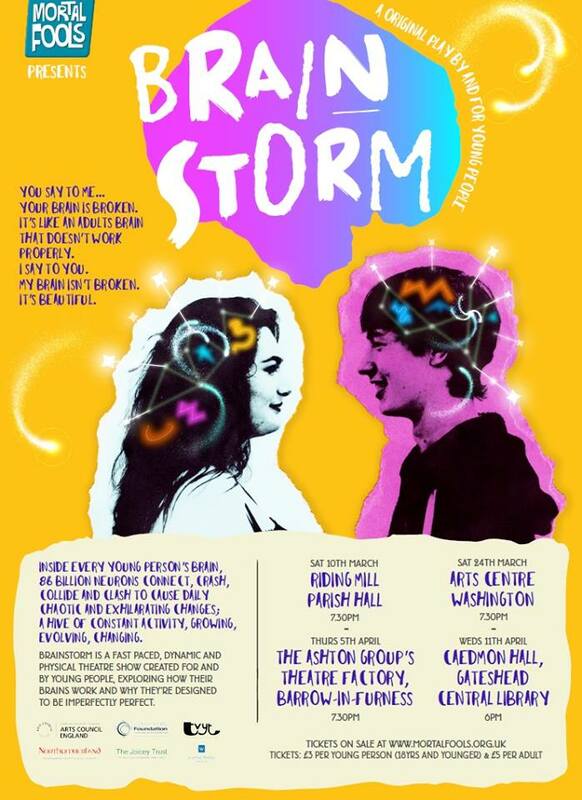 Brainstorm explores this through a poignant, honest, funny and thought-provoking show, challenging you to see young people and their brains in new ways whilst exploring themes around growing up, young people’s mental health and societal expectations. This is a play about us. And it’s a play about you. Tickets are £3 per young person (18yrs and younger) & £5 per adult.